Is Strayer The Best For-Profit Education Company for a Profitable Investment Portfolio? 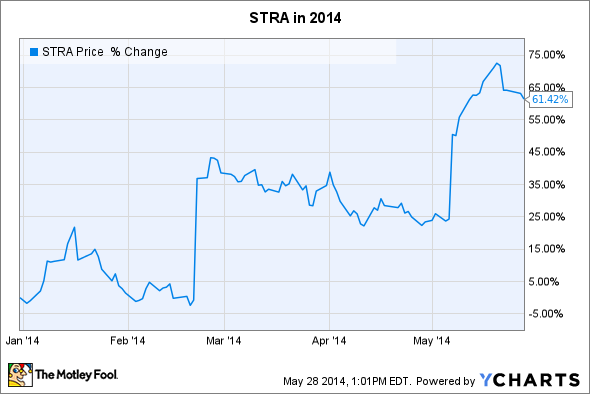 Strayer’s stock has increased over 50% in 2014. So does an investment in Strayer still make sense, or is the best behind it? Strayer Education (NASDAQ:STRA) is in the midst of a restructuring program to keep it viable in the changing education industry. Strayer is looking to reduce its operating costs by $50 million and has closed 20 underperforming locations in the Midwest . The company is beefing up its online presence while reducing its more costly brick-and-mortar locations. This is important as students continuously look for their education to be on-demand, mobile, and readily accessible. Strayer's stock has risen over 61% in 2014 in light of its earnings and revenue beating Wall Street's estimates over the last year. After the run-up, does Strayer still make sense as an investment? There are many players in the for-profit education space that compete with Strayer, but Apollo Education Group (NASDAQ:APOL), DeVry Education Group (NYSE:ATGE), and ITT Educational Services (NASDAQOTH:ESINQ) are some of the major ones. Given Strayer's significant increase in 2014, would one of its competitors make better sense as an investment at this point? ITT is the clear investment choice when looking at earnings going back over the past year. ITT's P/E of 7 is less than the next lowest company's P/E by over 50%; Apollo has the lowest P/E after ITT at 15. Strayer's P/E as well as DeVry's is far ahead of Apollo's, ITT's, and the S&P 500's P/E, which is currently 18. ITT is also the clear investment choice on a forward earnings basis with a forward P/E of 6. ITT's P/E is half of the next-lowest P/E, which is Apollo's 12. Strayer and DeVry are not far behind Apollo, with P/E's of 15 and 14 on a forward basis. Although their trailing P/E ratios are lofty, Strayer's and DeVry's forward P/E ratios make more sense on an investment basis even with ITT's forward P/E at a minuscule value of 6. ITT is also grossly undervalued on a PEG basis. The PEG ratio is like the forward P/E, but considers five years instead of one year of future growth. Further, a PEG value under 1.0 indicates a low valuation while a value equal to 1.0 indicates a fair valuation. ITT is the only education company with a PEG under 1.0 at 0.4. The other three companies have PEG values over 1.0, but not at an exorbitant clip. Strayer does have the highest PEG, however, with a value of 1.5. Strayer is one of the more attractively valued for-profit education companies on a cash flow basis with a P/CF of 7. ITT is the lowest, however, with a P/CF of 4, almost half of Strayer's. Nonetheless, Apollo and DeVry are not overly valued on a cash flow basis with P/CF multiples of 8 and 11, respectively. ITT is the clear investment choice given the valuation metrics outlined here. Such low valuations in comparison should cue investors to dig deeper, however. What they will find is that ITT withdrew its guidance for the year and its stock fell 20% as a result . Further, the company is experiencing a series of investigations related to potential violations of federal securities laws. Therefore, the truth is not all in the numbers and investors should show caution before initiating an investment in ITT. Is Strayer the best investment given ITT's troubles? On a cash flow basis, Strayer looks the most attractive excluding ITT with a P/CF of 7 compared to Apollo's 8 and DeVry's 11. Strayer is more expensive than the other three education companies on a trailing and forward earnings basis, however. Therefore, the verdict is unclear. The company is in a turnaround and has been executing on its plan in 2014. Whether Strayer will continue to execute and prosper remains to be seen, however. An investment in Strayer then should be monitored closely as the company is in a transition phase and its stock is richly valued and modestly valued on disparate metrics.